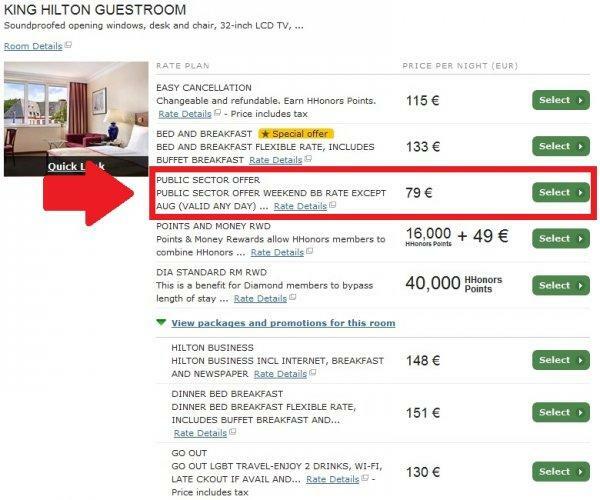 Hilton has a very good offer for public sector workers in the UK & Europe. You can get 40% discount off of BAR (Best Available Rate) that includes breakfast on weekend stays (Friday, Saturday & Sunday) at participating hotels. Although this is a weekend offer, some hotels may offer the rate during the weekdays and the rate is available every day at participating hotels during the month of August. The discount is 40% off of the breakfast inclusive rate at Waldorf Astoria, Conrad, Hilton, DoubleTree and Hilton Garden Inn locations. The discount at Hampton Inns is 20%. Note that this rate is restricted to those that are employed by the public sector and the rate code is PR11PN. The hotel participating of this offer is not very good, but the discount is very good at those hotels that have the rate plan loaded. This is excellent offer for those that are public sector employed and thus eligible per the rate rules. Whether the eligibility is checked by every property and all the time, I doubt it.